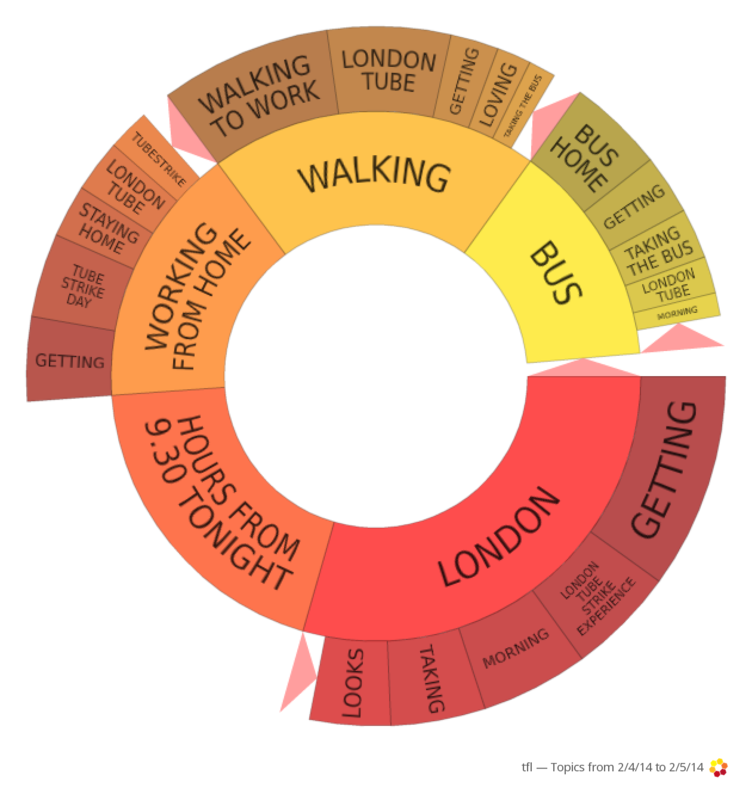 On the start of the second day of the strike, we, at 5W, were intrigued about Londoners’ reactions to the disruption to their daily routine by the tube strike. 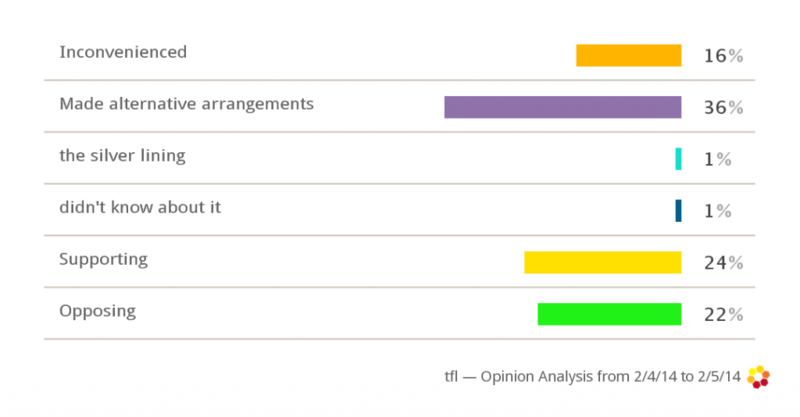 Using Crimson Hexagon’s Forsight platform we analysed 17,500 twitter posts and comments from people in the UK voicing their opinion and relating their experience during the last two days’ events and decided to bring you this light blogpost showing you the results. The majority of the posts were from commuters or would-be commuters in London as we can tell from the context of the comments – something easily done in social media. The opinion was split between supporting and opposing (24% and 22% respectively). But beyond the politics and the expected reactions to being inconvenienced, we were amazed by people’s ingenuity and their positive attitude. A full 36% of the comments mentioned using alternative modes of transport – walking, cycling, organising guided cycling groups, and even offering to share the car ride to-from work. Indeed, many rationalised the trouble by focusing on the benefits (health) they got – we assume – as a way to keep their joyful mood. 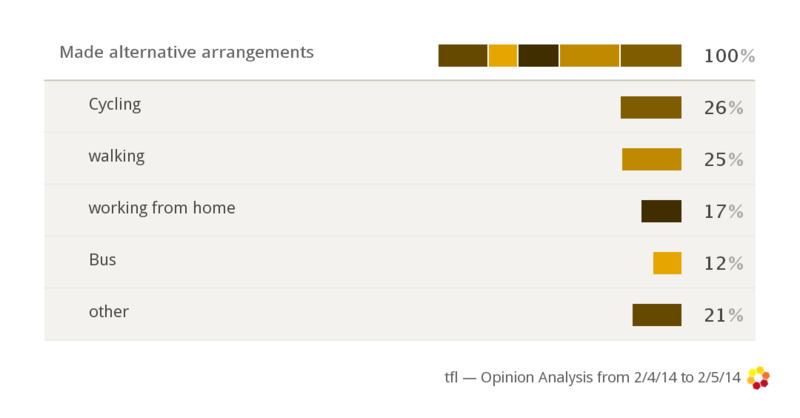 Then we looked at the details of the alternate arrangements and how they stack up against each other. Cycling and walking topped the list of alternative modes of transport (26% and 25% respectively) followed by staying at home working remotely. Some people used the Thames boats for the first time and enjoyed the experience while others discovered new locations and landmarks they didn’t know existed on their route to work (category “other” includes boats, horse-riding, and car sharing). So cheers to a healthier and more optimistic London and good luck to all of you out and about today; we hope everyone will be inspired to try new ways to tackle the daily obstacles they face.